The National Chairman of the New Patriotic Party, Hon. Freddy Blay has told the Daily Guide that, he will not hestitate to recommend the KANTANKA Vehicles for government to purchase for Public Institutions to use, if he gets the opportunity. According to him, apart from being a Ghanaian product, the vehicles have proven to be good, strong and durable, just as others that are imported from outside the country. One 4-Wheel Hard-Body KANTANKA OMAMA Pick-Up was spotted among the vehicles forming the National Chairman's convoy he travelled to Bolgatanga with, on Monday July 24, 2017. 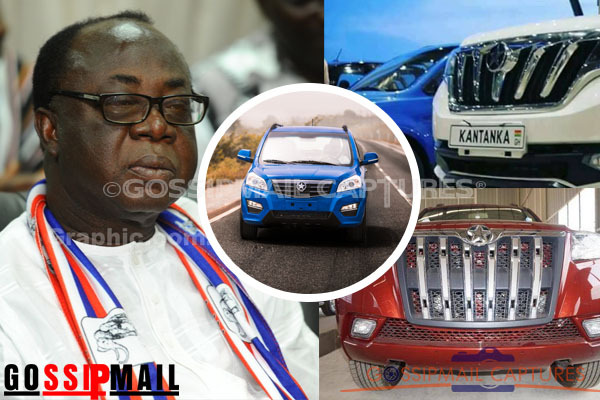 Asked how he sees the KANTANKA OMAMA Hard-Body Pick-Up in his convoy, the Acting National Chairman of the New Patriotic Party, said, “… I have been watching the vehicle as we travelled from Accra all the way to Wa and we are here in Bolgatanga in the Upper East Region. I don't think it has given us any problem, neither has it caused us to delay on any of the routes we have taken. The drivers and Security Officers are full of praise for the Pick-Up and I endose it too. If I get the opportunity to recommed any type of Vehicles for Public Institutions to use across the country, I will mention KANTANKA.” He said. The National Chairman and some other National Executives were in Bolgatanga for the Upper East Regional Congress of the New Patriotic Party. Earlier in an interview with a local Radio Station, Tanga Radio, Hon. Freddy Blay, said the New Patriotic Party government is bent on making the lives of many Ghanains better than it is now. “Even with transportation; apart from Air Transport, government also wants to improve on land transport, and that is why the government will be paying more attention and some investment to the railway network. Government intends stretch the Railway all the way to Paga in this region. If this is done, transporting goods across the country will be faster and effective.” Hon. Blay noted. The Marketing Manager for KANTANKA Automobile Company Limited, Kwabena Agyepong, has assured that, the Company has grown and can meet the demands, if the government decides to order KANTANKA vehicles for Public Institutions. “Currently, we produce according to clients demand. … if we are to operate at our optimum capacity, the Company can produce 20 Vehicles a day from all our five sites. Our Vehicles are strong and can go through any terrane.” Mr. Agyepong assured. Touching on the Party's victory in the 2016, Hon. Freddy Blay said, the victory was not a magic, rather, it was as a result of hard work and the fact that, the National Democratic Congress government then, had lost ideas and many Ghanaians saw the government then, as encouraging corrupt practices and engaging in unnecessary and profligate expenditures. Contrary to fears that the Free Senior High School Education may be “aborted” before the next academic year, Hon. Blay stressed that, President Akufo-Addo is committed to the initiative and had put people together to do all the checks and put the figures together, so that, the Free SHS Education can take off in September 2017.